A rare opportunity to check out the work of one of the most famous visual artists in the Arab world is on offer in Galway next week when leading Palestinian cartoonist Mohamed Sabaaneh hosts a talk and exhibition in the city. The exhibition at the Black Gate Cultural Centre on Frances Street (Wednesday, 7pm) is a rare opportunity for an Irish audience to check out his black and white images which have been printed in newspapers all across the Arab world. His political cartoons, which are brimful of action and dramatic images, are seen a form of solidarity with ordinary Palestinians in their daily struggle for survival and ongoing battle for justice. He is also a man who has served time in prison for his art. 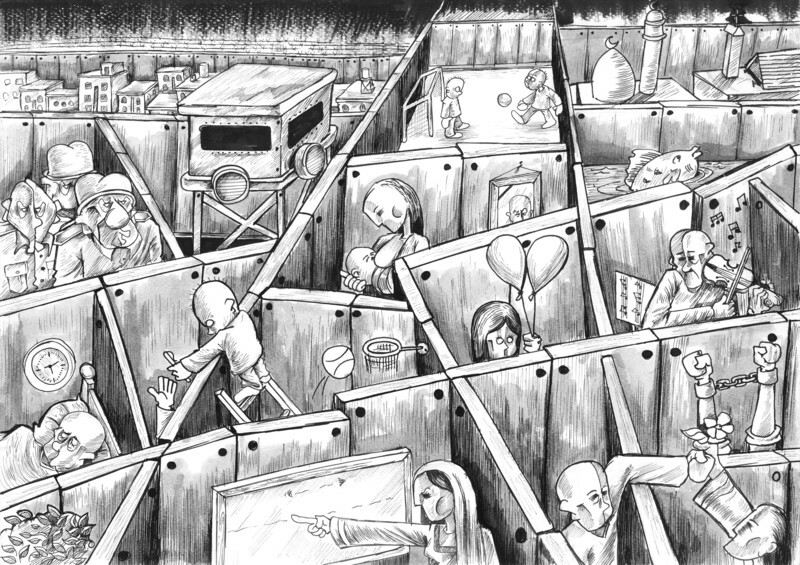 Sabaaneh is considered an inspiration to cartoonists all around the world and his work goes straight to the essence of the stark reality of life under the Israeli occupation. A painter and caricaturist, Mohamed has a daily cartoon in the Palestinian newspaper al-Hayat al-Jadida and his work is familiar to readers all across the Arab world. Sabaaneh is the Middle East representative for Cartoonist Rights Network International and the Palestinian ambassador for United Sketches, an international association for freedom of expression and cartoonists in exile. 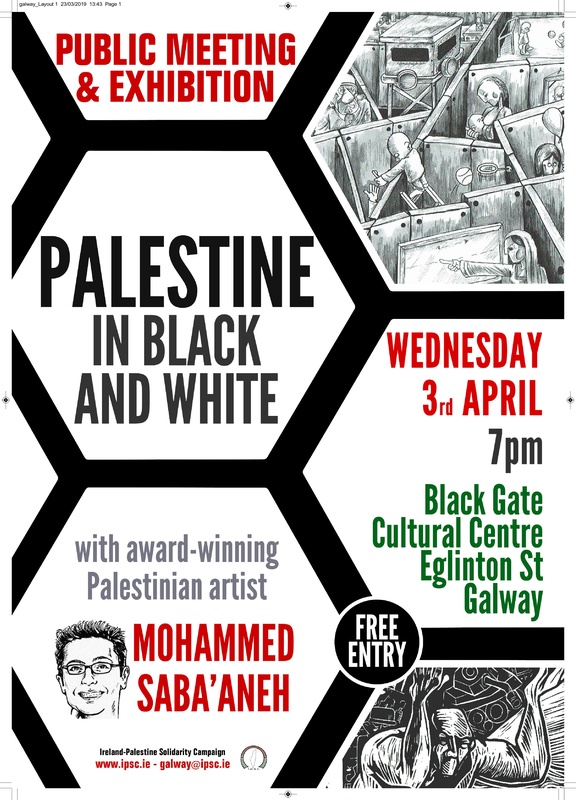 His work has been exhibited in solo and group shows around the world and the Galway branch of the Palestine Solidarity Campaign is thrilled to be able to bring Mohamed, and his work, to the City of the Tribes. Mohamed has won numerous awards, including the 2017 Marseille International Cartoon Festival Prix d’Or. He lives in Ramallah, Palestine. His touring exhibition, ‘Palestine in Black and White’, is an intimate and powerful portrayal of life under occupation. He has gained worldwide fame for his black and white sketches. His stark geometric figures and landscapes are rich with Palestinian visual traditions and symbols, while his haunting figures depict a vivid perspective of the occupation. The exhibition includes some of Sabaaneh’s most striking works, including cartoons that portray the experience of Palestinian prisoners, drawn while Sabaaneh himself was detained in an Israeli prison. The drawings do not flinch from revealing the terrible reality which confronts Palestinians living under a brutal occupation and his visit to Galway seems hugely appropriate at a time when a debate is raging over whether or not Ireland should boycott the Eurovision Song Contest in Tel Aviv. The event takes place on Wednesday, April 3, at 7pm and all are welcome. Those with an interest in human rights, cartoonists, and visual artists are particularly welcome. If you are looking for a blogger for your business website, please contact ciaran@ciarantierney.com. I have almost 30 years’ experience in journalism, blogging and contact writing. Previous Previous post: Bridie (107) joins the “lost tribe” of Galway!